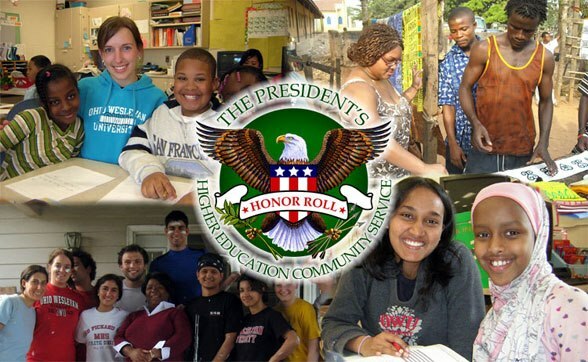 Ohio Wesleyan is among schools on the 2014 President’s Higher Education Community Service Honor Roll. OWU earned recognition for both general community service and for interfaith community service, with distinction. This marks the sixth consecutive year the University has been named to the national Honor Roll. In fall 2015, Ohio Wesleyan also is named a Top 5 national finalist in the President’s Interfaith Community Service Campus Challenge in the category of interfaith community service. And for 2009, OWU was named one of three recipients in the country of the Presidential Award for Excellence in General Community Service. Each spring, Ohio Wesleyan faculty, staff, students, and community agency partners are urged to nominate current students who have made significant contributions through service. The community service awards are given at the annual “Golden Bishops” event in April.